Happy New Year!!! The plan this year is to keep experimenting with new (to me) products like Gelatos, Big Brush Pitt Pens and Dylusions Spray Inks and techniques. I'm so looking forward to making more art journal pages. I'd like to do some mixed media canvases to!!! During the Christmas break I was able to play in my test journal and actually complete my 2nd Art Journal page. My friend Tracy and I decided to continue with challenging each other. This time it was a Winter/Christmas theme and we have until mid January to complete it. This came together very quickly for me as I had a pretty good idea of what I wanted to do. I just had to do some experimenting with colours and textures. This first picture is my test page of the colours I planned to use and some stamping and doodling. I also played with white embossing paste and glitter. 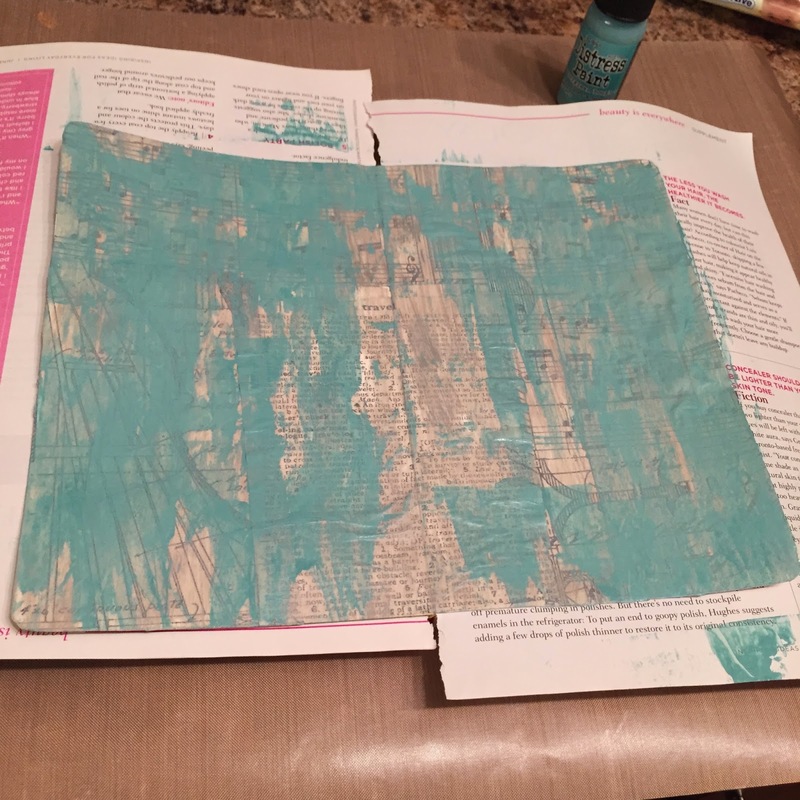 And this is a little peak at the first few steps of my 2nd Art Journal Page. I adhered printed tissue paper with Liquitex Matte Gel Medium (under and over) and then applied the first layer of colour, Evergreen Bough Distress Paint, which I spread out with a credit card. I love your test piece. Your test page looks great...can't wait to see the final project.